No more pinched tubes when installing a tire. Powerful rack and pinion system. Components custom CNC machined in the USA. 6061 anodized aluminum bracket and axle shaft for light weight. Steel handle and bead push rod for high strength. Black oxide treated for surface protection. Strong and light weight system - perfect for taking on the trail or off-road. Total weight 1.8 pounds - hardly noticeable in your travel pack. Takes the hassle out of tire installation. 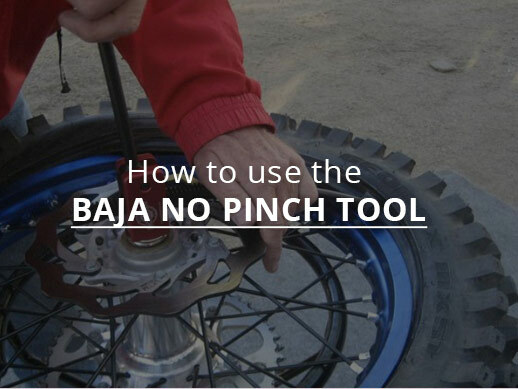 The Baja Tool comes with a 20mm axle shaft. If you need a different size, please order either the 25mm sleeve or the 17mm shaft accessory. Note: the 17mm sleeve is perfectly designed to screw in and replace the 20mm shaft that comes with the Baja Tool and the 25mm sleeve is meant to fit over the original 20mm shaft. The tool breaks down into three parts, with the longest part being 12 inches. These parts will roll up into a compact bundle and at 1.8 pounds are hardly noticeable in your travel or fanny pack.